Every shipment processed in Easyship will require a shipping documents. By default, all documents are provided in an A4 or Standard Letter sized format. You are able to change the format of your labels in the Label Printing Options on your Easyship Dashboard. 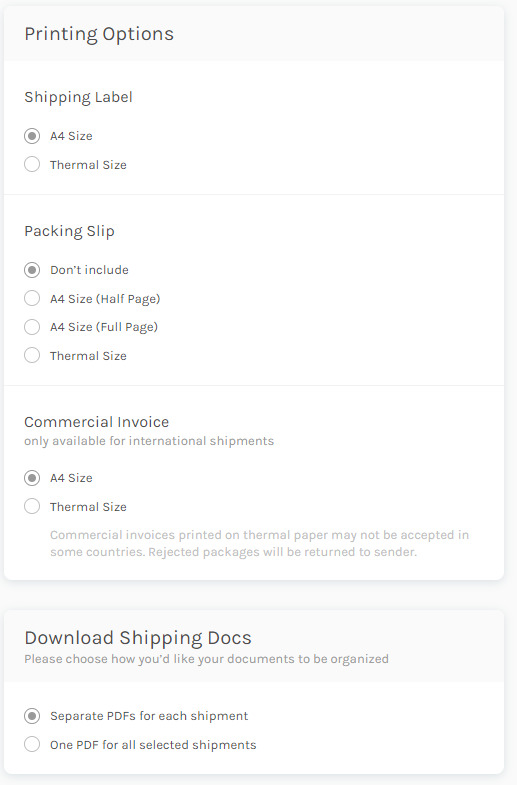 To define the label format of your shipment, please go to Printing Options in your dashboard. Once there, you can decide on the format of your labels. This also means that it is not possible to group Hong Kong Post shipping docs into a single PDF. They will also be provided separately. A battery declaration form and battery caution label are provided when a shipment contains items with batteries. These documents are only available in A4 as they must be printed in color to meet custom clearance requirements.